The Miami Dolphins defeated the New England Patriots 27-20 inside Hard Rock Stadium on a night where Jay Cutler outplayed Tom Brady. Brady was 24-of-43 for 233 yards, throwing two interceptions versus only one touchdown. He was not helped out by his running game, as the Patriots only rushed for 25 yards on 10 carries on the night. Cutler was 25-of-38 for 263 yards and had three touchdown throws to his credit. RB Kenyan Drake lead the team in both receiving yards (74) and rushing yards (114), and WR Jarvis Landry found himself in the end zone twice. Frustrating Brady tonight was CB Xavien Howard, who came away with both of Brady’s interceptions and multiple big plays. With that, we give you our PFF-exclusive takeaways from the contest for each team. Drake followed up a spectacular performance in Week 13 (95.9 overall grade) with another impressive showing on Monday night against Miami’s division rival. Drake earned 122 yards after contact on the ground against New England despite rushing for 114 yards total, forcing three missed tackles along the way. Through the air, he hauled in all five of his targets and gained 36 of his 79 receiving yards after the catch. New England blitzed Cutler on over half of his dropbacks on Monday night (21 out of 41) and he made sure they paid for it. When the Patriots rushed five or more defenders, Cutler completed 16-of-20 attempts for 186 yards and two touchdowns, good for a 138.8 passer rating against the blitz. Cutler also had a great deal of success in this one with the short-passing game, connecting on 21-of-23 attempts for 163 yards and two touchdowns on passes that traveled fewer than ten yards in the air. The second-year player out of Baylor played his best game as a pro on Monday night and his grade would’ve been higher if not for a defensive pass interference in the first half. 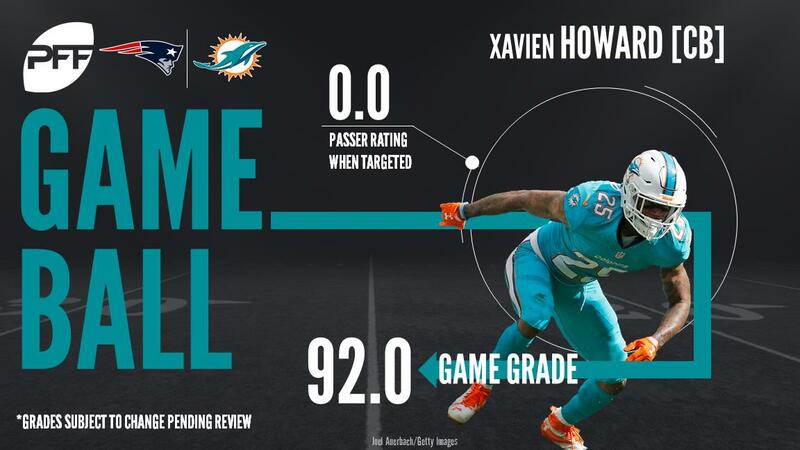 After an up and down season, Howard shined in coverage against the Patriots. He was targeted six times and did not allow a catch, while also notching two interceptions and a pass break up. Howard has been on fire the last two weeks, only allowing two catches on 15 targets with four interceptions and four pass break ups. Alonso has been another inconsistent player for the Dolphins defense this year but he played a well rounded game Monday night. His four stops led to a run-defense grade of 82.8 and he limited the big plays in coverage, allowing six catches for 47 yards, with the longest gain against him being a screen to Rex Burkhead. The duo of Dion Lewis and Rex Burkhead accounted for much of New England’s passing attack, as the pair were targeted a combined 10 times for 95 total yards. The Patriots only carried the ball ten times in the game, mostly due to being behind throughout most of the night. On the season, Lewis has caught all 20 of his targets thrown his way and has forced six missed tackles in the pass game. Outside of the two running backs, Brady struggled to consistently connect with his receivers on the outside, with credit being due to the Dolphins secondary. In all likelihood, Brady would’ve been more comfortable with tight end Rob Gronkowski in the lineup, as backup tight end Dwayne Allen was targeted only three times and only had 10 receiving yards. Brady was pressured on 16 of his 45 drop backs, completing six passes for 98 yards with a passer rating of 90.8. The only Patriots player on Monday night to earn a grade north of 80.0, Guy had arguably his best game of the season down in Miami. The former seventh-round pick was on the field for 54 defensive snaps (a season high) and was able to contribute in a variety of ways. He tallied two pressures on 24 pass-rush snaps and also batted a Cutler screen pass down at the line of scrimmage. He also had four run stops, tying his season high. Out of 80 qualified interior defenders, Guy was one of just seven to record at least four run stops in Week 14. Gilmore had been on a hot streak coming into Monday night’s matchup with the Dolphins, finishing Week 12 and 13 with game grades of 89.3 and 92.6, respectively. That streak did not continue into Week 14, Gilmore allowed two of three targets to be caught (both resulting in a first down) to go with a pass interference penalty early in the game. New England’s big off-season signing now ranks 20th out of 118 qualified cornerbacks this year with an 84.8 overall grade.